If you don’t like the taste of spirulina or you just want to be able to take it “on the go” then spirulina capsules are a great choice. In this review I’ll be going over BRI Nutrition Spirulina Capsules and why I think they are top quality and worth the buy. The main things I look into are: is the source reliable?, how good quality is the spirulina?, and is the price OK?. First off, where is it made? And is it a reliable source? Right off the bat you what caught my eye is that this product is made in the USA, in California to be exact. This is a big deal to me. Products from some countries (like China) you cannot trust because manufacturing is largely unregulated. With products like this you cannot trust the label or much of anything. Since this product is made in the USA it is subject to regulations that add trust to the product. This particular product is manufactured in a FDA inspected facility which ensures safe manufacturing processes and is GMP (good manufacturing practices) certified. It is also NSF Certified. If you have never heard of this, it is a big deal. NSF certification comes from The Public Health and Safety Organization ensures that the products comply with public health and safety. They go through extensive product testing and material analyses before giving certification. And they inspect the place of manufacture regularly to make sure its still up to par. Since this product is inspected by authoritative third party organizations I trust it. You can’t ask for that much more when it comes to product safety. 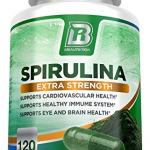 Next up, How good of quality is BRI Nutrition’s Spirulina Capsules? One thing that I like about its quality comes from the environment in which it is grown. Its grown like its been grown for hundreds of years. The old fashion natural way of sunshine and fresh water, no UV lights or other machines used here. The capsules that the sprulina is in are made of vegetable cellulose and they are good quality. You know how when you buy cheaply put together capsules you can still taste the supplement on the outside of the capsule? Not these. These are clean on the outside and you shouldn’t taste a thing, which is nice because pure spirulina tastes nasty. 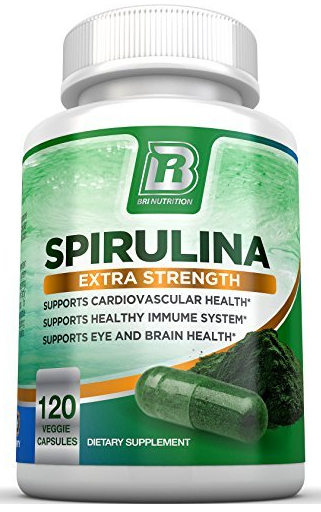 The cheapest place to buy BPI Nutrition Spirulina Capsules is on Amazon.com for ~$16.00. And the amount it include is 120 capsules. But.. It takes 4 capsules to make a serving which is 2000mg or 2g of spirulina. So what you get is 30 servings at 2 grams each. Thats just slightly over 50 cents a serving, which isn’t bad compared to other spirulina products. The dosage per serving here, which is 2 grams, is actually a lot when it comes to spirulina capsules. Spirulina powders generally have higher serving sizes than this but the capsules usually don’t. In fact there are a lot that have serving sizes (per day) as low as 1 gram. This product’s dosage is definitely on the higher side and thats good. Well thats up to you. But you won’t find much higher quality spirulina than this that comes from a very reliable source. It is more expensive per gram than spirulina powder, so that might be a better choice for you if its money you are worried about. But I’m guessing that you want the capsules because you don’t want to have to deal with the taste. I would say its a great deal and worth a try. Or read from hundreds of customer reviews and then decide. If you have tried this product and have a review you should leave it below in the comment section. Thanks.